When purchasing clothing and shoes over the internet, the customer needs quality photos of each item for viewing it from different angles and examining details, as well as information about colors and sizes available, the material, care instructions, and so on. In order to make purchasing and selling clothing and footwear in the internet easier, these Yandex.Market categories (clothing, shoes, bags, and accessories) use a special interface for product selection, and also have more stringent selection of offers for these categories. In clothing categories, as in other popular categories, product profiles are used (for example, Levi's 501 jeans). The profile includes all possible color and size variations of the model, along with offers from different stores. Data about product offers related to the Одежда, обувь и аксессуары category must be passed in YML format. YML format is described in detail in the section YML format. Other data transfer formats do not support passing product characteristics that are used for filtering product offers in Yandex.Market search results. This means that product offers passed in a format other than YML will be published and available on Yandex.Market search, but will not be associated with product profiles. Publishing product offers on Yandex.Market must not contradict the Requirements for advertising materials. For a product offer belonging to the Одежда, обувь и аксессуары category, you must specify the manufacturer or brand name. To pass information about the manufacturer, use the <vendor> element. If the manufacturer is not specified, the product offer will not be associated with the product profile and will only be available through Yandex search. For a product offer belonging to the Одежда, обувь и аксессуары category, you must specify the color. To pass information about the color, use the <param name="Цвет"></param> element. If this element is not specified in the product offer description, the offer will not be shown when filtering by color on the category page. For values, we strongly recommend using common color names (such as red, blue, and so on) rather than exotic names (such as the color of green algae sparkling in the sun). For multicolored items, we recommend specifying the predominant color of the product, or the “multicolor” value. For products with a pattern, we recommend specifying the predominant color of the product, and setting the type of design in the additional <param name="Тип рисунка"></param> element. When multiple values are set in the <param name="Цвет"></param> element, only the first one will be used. When multiple <param name="Цвет"></param> elements are set for a single offer, only the first element in the list will be used. For product offers that the concept of size applies to, you must specify the size. To pass information about the size, use the <param name="Размер"></param> element. When describing product offers for which size is not applicable (such as sunglasses or a neck scarf), this element should not be specified. If the <param name="Размер"></param> element is not specified in a product offer description that the concept of size applies to, the offer will not be shown when the category page is filtered by size. For the element value, we recommend using Russian size charts, but you can use sizes from common sizing systems (European numbered or lettered sizes, English sizes, etc.). In order for offers to be displayed correctly when filtered by size within a category or in search results, as well as when choosing a size on the product profile, you must specify which type of sizing is used in the product offer description. Pass sizing information in the unit attribute inside the <param name="Размер"></param> element. INT — international size labels (for clothing: XS, S, M, L, XL, XXL, 2XL and so on; for bra cups: AA, A, B, C and so on). Round или “окружность” — окружность в сантиметрах. If clothing for girls, boys, and babies uses the child's age or height to indicate the size, the name of the sizing system (unit) must be “ Height ” or “ Months ” / “ Years ”. When specifying child clothing sizes in country-specific sizing systems (RU, EU, DE, IT) containing age or height, they will most likely be recognized correctly. Если для товарного предложения необходимо задать несколько размеров разных измерений, их можно выгрузить в виде нескольких элементов, указывая в атрибуте name какой размер задается. Например, при описании мужских рубашек могут потребоваться два параметра размеров (Размер рубашки и Обхват шеи), а для комплектов женского белья — три параметра (Объем чашки, Обхват груди, Размер трусов). In the categories listed above, we strongly recommend specifying each size parameter separately. If you are not able to do this, as an exception for underwear, the <param name="Размер"></param> element can indicate composite sizes such as 75B, where 75 is the band size in centimeters and B is the cup size. For jeans, you can also use composite sizes such as 34/32, where 34 is the waist size in inches, and 32 is the inseam in inches. If multiple values are specified in the <param name="Размер"></param> element (for example, <param name="Размер" unit="RU">40, 42, 44, 46</param>), only the first value in the list will be used. If the concept of "one size fits all" applies to the product offer, use "UNI" (for unisize) as the size value. If you want to specify a size used by a specific manufacturer, set the value of the unit attribute to “ BRAND ” (for example, <param name="Размер" unit="BRAND">26</param>). 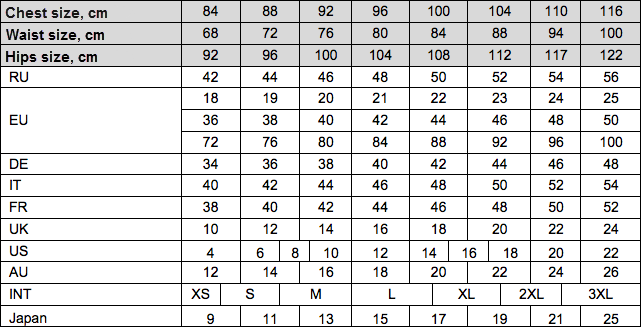 You will also need to send a size chart for this sizing system to the Support service. In this case, sizes will be converted using the sizing conventions from the manufacturer that you specified in the product offer description. If you use a sizing system that differs from common systems, you should also send a description and size chart to the Support service. We will add it to our sizing systems to allow correctly detecting the sizes of your products. For a product offer belonging to the Одежда, обувь и аксессуары category, you must specify at least one product image. In this category, as in other Yandex.Market categories, you can upload multiple images for a single product offer. In addition, there is a feature for uploading large-size images for viewing enlarged images in Yandex.Market search and in product profiles. The main product image should be specified first in the list of images in the product offer description. The first image in the list is considered the default image and will be used as the product image in Yandex.Market search. Other images specified for this product will be available in the enlarged viewing mode for the product. Publish an image of the product in the same color as is indicated in the offer description (for example, a red dress should not have a picture of the same dress in a green color). An image of clothing should use a photo of the product on a mannequin or model (in the latter case, it is undesirable to cut off the head, ears, hands, feet, etc.). The main image should show the product in its entirety, and not a separate detail (such as the collar or pocket). A photo of a detail on the product is better placed in the extra images (for example, a close-up of embroidery or a knitting pattern). Use product images on a light background. Images on transparent backgrounds are not supported. We recommend specifying the category a product offer should be placed in on Yandex.Market. The category is passed using the <market_category> element in the product offer description. In this element, only category names from the list of product categories on Yandex.Market are allowed. Download the Yandex.Market category list in XLS format. The <market_category> element is not required, but it allows the consideration of your wishes for assigning products to categories on Yandex.Market. For each product offer, only one category may be specified. For an offer belonging to a subcategory in the Yandex.Market list of categories, the <market_category> element can specify the complete path to this category using the “ / ”separator. Для передачи информации о том, для какого пола предназначено товарное предложение, относящееся к категории Одежда, обувь и аксессуары, используется элемент <param name="Пол"></param>. Возможные значения элемента: “ Женский ” и “ Мужской ” . The <param name="Пол"></param> element is not required, but we recommend using it so the system can place your product offers within the Yandex.Market categories more accurately and correctly associate your offers with the appropriate product profiles. Для передачи информации о том, для какого возраста предназначено товарное предложение (то есть в каком разделе это предложение будет размещено), используется элемент <param name="Возраст"></param>. Возможные значения элемента: “ Взрослый ” , “Детский” и “ Для малышей ” . The value “ Взрослый ” applies to clothing offers with a line of sizes that includes a sizing system for adults. For example, clothing for teenagers is usually considered adult, because a 15-year-old girl searching for clothing will most likely use the section Женская одежда rather than Детская одежда. Children's clothing usually includes offers with a line of sizes intended for children (the age depends on the brand, but usually ranges from 2 to 14 years). Baby clothing includes offers for children up to 2 years old. The <param name="Возраст"></param> element is not required, but we recommend using it so the system can place your product offers within the Yandex.Market categories more accurately and correctly associate your offers with the appropriate product profiles. For different color and sizes variations of the same product, the link to the offer on your website should preferably show different links for each color and size combination, though you may specify the same URL for all of them. In the first case, users who have selected a color and size of the model on Yandex.Market can go to the product page on your site with the color and size already set. We recommend forming links with consideration for the colors and sizes indicated in the product offer, such as http://best.clothes.ru/product_page.asp?pid=12344&colour=14&size=44. To pass information about what material the product is made from, use the <param name="Материал"></param> text element. This element should briefly describe the fabric contents (or multiple fabrics). You can also use the <param> element to indicate that the product offer is specialized for certain types of sports, in order to have this product offer fall into the correct category. To do this, enter the sport that the product offer is designed for in the element. A model from the Одежда, обувь и аксессуары category is considered part of a group if it comes in multiple sizes and/or colors. When describing such products in the YML file, you must create a description for each variation (a single <offer> element describes a single product offer, in one size and one color). To correctly associate all the product modifications with the product profile, the description of each product offer must use the group_id attribute. The attribute value must be an integer with no more than 9 digits. For all offers that need to be associated with the same product profile, an identical value should be set for the group_id attribute. However, you must not set this same value for offers that do not belong in this product profile. For example, if a dress you are selling is available in 3 different colors and each color is available in 4 sizes, you must describe 12 product offers, and set the same group_id in each of them. We recommend uploading an image of the item in the corresponding color for each variation of the group model. синтетической ткани чёрного цвета. Утеплитель: натуральный пух и перья. Яркий полупрозрачный комплект, состоящий из бюстгальтера и трусиков. Украшен рисунком в горошек. Бюстгальтер тонких бретельках регулируемой длины. шлевки для ремня. Модель оформлена втачными карманами. Форма брючин – прямая. как для новичка, так и для опытного горнолыжника. Модель выполнена из натуральной черной замши со вставками из нубука. строение стопы, которая поможет снять усталость и отеки. из текстиля. Внутри имеется небольшой ремешок на руку.